To give you an idea of what’s available when you dine at Disney’s Hollywood Studios’ ’50s Prime Time Cafe, here are a few sample items from a recent menu. Mickey’s Bee Bop: Cherry soda served with an ice cube that has a bee frozen in it. Chicken Noodle Soup: Served “just like Mama used to make” (to sick guests only). Onion Rings for Two: Because you don’t need to be a pig and eat all of them yourself. Grandma’s Chicken Pot Pie: Just like Grandma used to make, but without the complaining, lame old-time stories, and occasional incontinence. Mom’s Old-Fashioned Pot Roast: Proving that, even though it’s the ’50s, Mom was a child of the ’60s. Crazy Cousin Buford’s Stuffed Pepper: Nobody has any idea what’s in this thing. Trendy Little Sister’s Fish Sandwich: We’re guessing that she doesn’t understand that fish isn’t vegetarian. 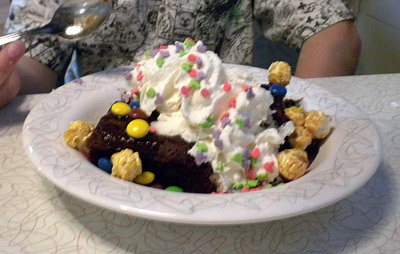 Dad’s Brownie Sundae: No, you can’t have a bite. Grandma’s Bread Pudding: Seriously, get your own. Baby Brother’s Ice Cream Sundae: Sorry, he’s not going to share. Mom’s Fruit and Cottage Cheese Plate: This you can have. 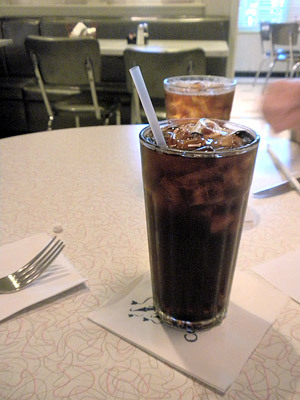 The Diet Coke was delicious and nicely matched the restaurant’s decor and atmosphere. It also went well with the rest of our meal, which was quite good. ’50s Prime Time Cafe is a unique, atmosphere-rich eatery found in Disney’s Hollywood Studios (it was moved there from Disney MGM Studios in 2008). The restaurant is decorated like a gigantic stereotypical 1950’s family sitcom house, from the plastic flowers to the tacky knickknacks, to the ankle-height end tables, just made for wacky slapstick antics. There are no cast members here, but rather family members. If your server is a woman, she isn’t a waitress, she’s “Mom,” ready to make sure you eat your peas, clean your plate, and feel guilty for not calling her more often. If you’ve got “Dad” waiting on you, he’s wearing a suit, smoking a pipe, giving out advice, and calling “Mom” over from another table whenever actual work needs to be done. And of course there’s “Brother,” bussing tables, giving out random wedgies to unsuspecting diners, and saying “good boy!” to Fido, who is constantly underfoot. Each table (either a Formica counter or a TV tray) has a small television on or near it, showing clips from old black-and-white family sitcoms. Observant guests will notice that every show has a common theme — something wacky or embarrassing that happens to someone who harasses or under-tips a waiter or waitress. You want what they’re having? If they jumped off a bridge, would you do that, too? That napkin isn’t going to pick itself up. I’m not going to ask you again — what would you like to order? How do you know you don’t like it if you haven’t tasted it? You want me to take that back? What am I, your maid? What part of “we don’t serve Pepsi” don’t you understand? It’s no use crying over spilled Lightning McQueen Raceway Punch. Don’t put that in your mouth; you don’t know where it’s been. If you’re going to the restroom, call me when you get there, just so I know you’re okay. Why are glowing ice cubes extra? Because I said so, that’s why. If I told you once I told you a thousand times, appetizers aren’t included. I know it isn’t fair that the dining plan no longer includes a tip. Well, life isn’t fair. This bill is going to hurt me more than it hurts you. I brought you into Disney World and I can take you back out! Don’t eat that — you’ll get worms! You call that a tip? Do you think I’m made of money? Beginning in about a week, Sounds Dangerous at Disney Hollywood Studios will be closed for lengthy refurbishment. Apparently, due to a fluke in a maintenance contract, none of the lightbulbs in this theater have been replaced in years, so guests have been suffering through much of the attraction in what pretty much amounts to near darkness. 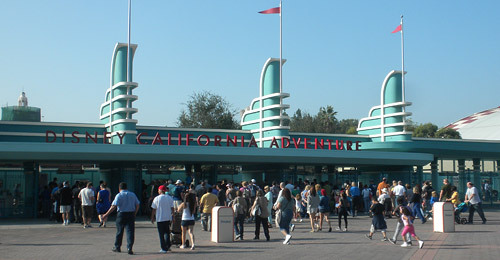 When the attraction reopens, it will have all new, long-lasting, energy-saving light bulbs, remedying this problem. After a long journey, the Block Party Bash parade has arrived in Florida and is being prepared to premier at Disney’s Hollywood Studios later this month. But already there are hints that the move from California to Florida was not as smooth as it could have been. Apparently, the parade performers, all native Californians, are having trouble adjusting to their new Florida home. Only time will tell if they will be able to adjust. The Osborne Family Spectacle of Dancing Lights is lit at Disney-MGM Studios, bringing more than 6,600,000,000 tiny lights (one for each person on Earth, updated nightly) to life each night with enough electricity to power a destitute South American town for an entire year! The lights are programmed to twinkle and dance in tune to lively Christmas music (“Father Christmas,” “Christmas Wrapping,” “Oi to the World!,” etc.) and may prove inadvertently fatal to epileptics. We close with a bit of sad news for fans of Christmas lights. This is the last year that the Osborne Family Spectacle will be shown at Disney-MGM Studios. Next year, and presumably for the foreseeable future, it will be presented for holiday celebrations at Disney’s Hollywood Studios instead. Sorry! In addition to switching signage, Disney will have to make many more subtle changes to the park, in keeping with its new image. For example, all the animatronic figures in The Great Movie Ride will now wear Muppet masks, and the title character in the Indiana Jones Stunt Show will be portrayed by Kim Possible. Hanesbrands Inc. has signed up as sponsor of Disney-MGM Studios’ Rock ‘n’ Roller Coaster Starring Aerosmith. An exciting line of Hanes Men’s Rock ‘n’ Roller Briefs (as worn by Aerosmith) was also announced.